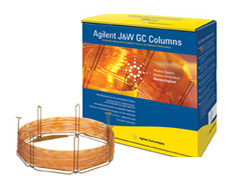 Agilent J&W Scientific GC columns offer the highest quality and performance of any GC columns on the market today. From the lowest bleed levels and the best inertness for acid, base, and mixed functional compounds, to the tightest column-to-column reproducibility, Agilent GC columns deliver superior reproducible performance for benign to the most difficult types of samples. CAM, Carbowax 20M, and OV-351 GC columns are not bonded and cross-linked, therefore Agilent J&W does not recommend solvent rinsing.